(CNN) -- Formula One's budget cap row looks over as Ferrari and other leading teams submitted conditional entries to the 2010 world championship on Friday. 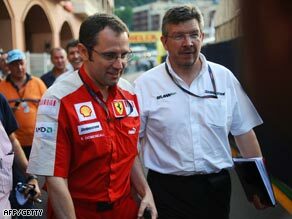 Ferrari's team manager Luca Baldisseri (L) and Brawn GP's team principal Ross Brawn leave the meeting in Monaco. Ferrari had led opposition from the Formula One Team's Association (FOTA) against proposals by motor sport's governing body Federation Internationale de ''Automobile (FIA) over a proposed $60 million limit on spending by the teams. The deadline to sign up for the 2010 season was Friday and Ferrari joined McLaren, BMW Sauber, Toyota, Renault, Red Bull Racing, Toro Rosso and Brawn GP in confirming their entries. Williams had broken ranks on Monday by signing up. "All FOTA Teams have today (Friday) submitted conditional entries for the 2010 FIA Formula One World Championship," the body said in a statement. "FOTA confirms all its members' long-term commitment to be involved in the FIA Formula One World Championship." Ferrari, who were among the founding teams of F1 back in 1950, had threatened to pull out of next year's championship unless FIA president Max Mosley allowed some leeway over the budget cap. The sides met with Formula One commercial rights holder Bernie Ecclestone at the Monaco Grand Prix last weekend to thrash out a compromise. FOTA said it had "unanimously agreed further and significant actions to substantially reduce the costs of competing in the championship in the next three years, creating a mechanism that will preserve the technological competition and the sporting challenge and, at the same time, facilitate the entry in the F1 Championship for new teams. "These measures are in line with what has been already decided in 2009 within FOTA, achieving important saving on engines and gearboxes." It is not the first time that FOTA has flexed its muscles, with F1 bosses forced to back down before the start of the season over controversial plans to introduce a new points scoring system to decide the world drivers championship, based on race wins. This year's championship is being dominated by the Brawn GP team whose chief Ross Brawn warned CNN last week that a Ferrari pull out would have been damaging for the sport. Brawn were one of the teams broadly in favor of the budget cap which would give smaller line ups the chance to compete in F1 and on Friday the new Prodrive line up also entered for 2010.